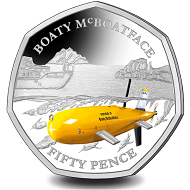 November 1, 2018 – The Pobjoy Mint has released the first ever 50 pence coin on behalf of the British Antarctic Territory. The design on the coin in Cupro Nickel Diamond Finish shows Boaty McBoatface submerged in the Antarctic Ocean with the research ship RRS James Clark Ross shown above sitting among the icebergs which make up the landscape of the Antarctic. Penguins can be seen swimming around Boaty McBoatface and also on the icebergs above. The Pobjoy Mint Effigy of Her Majesty Queen Elizabeth II is shown on the obverse of the coin. 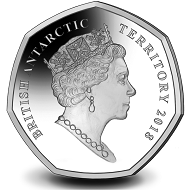 British Antarctic Territory / 50 pence / cupro nickel diamond finish / 8 g / 27.30 mm / Mintage: 6,000. When a campaign was launched to name the United Kingdom’s new polar research ship, there was one suggestion that caught the nation’s imagination. The name suggested was not thought suitable for the state of the art research ship but instead the Autonomous Underwater Vehicle (AUV) which will be carried on the research ship, the RRS Sir David Attenborough, will now carry the name Boaty McBoatface. Boaty McBoatface will be carried on the research vessel RRS Sir David Attenborough and will be undertaking scientific research. The findings will be sent back to scientists aboard the research vessel and on land. The AUV is able to travel on its own under water and ice reaching depths of 6,000m and with a range of 6,000km, which is reflected in the issue limit. In 2016 Boaty McBoatface underwent advanced sea trials from the existing research ship RRS James Clark Ross in preparation for the moment it is able to be placed on the RRS Sir David Attenborough. More information on this coin and other products issued by the Pobjoy Mint, visit the official website. While the name Boaty McBoatface is amusing, the work being done considerably contributes to serious research about what is happening in remote arctic waters due to climate change. The SciShow explains it in more detail. This article published in The Guardian tells you more about the robot submarine and its first mission.